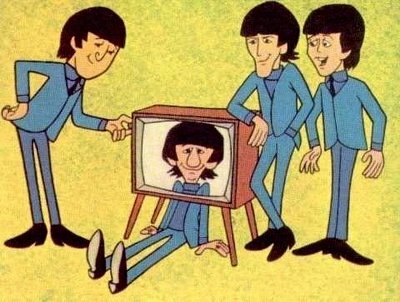 This was the first weekly TV series to feature animated versions of actual, living people. supplied their voices, although actual Beatles songs were featured. I use to watch them every saturday morning. I remember trying to watch this show, but it was on Sunday morning, just as we were leaving for indoctrina...I mean church. I only barely recall one where John tries to make it with a girl who turns out to be an alien and takes off in her flying saucer. Then they play "Ticket to Ride." Holy smoke, I think that mule must've kicked me in the head harder than I thought.